Queen’s University is playing a central role in an international consortium that has announced the development of a patch delivery system which will lower the chances of infection for those at very high risk of HIV. HIV pre-exposure prophylaxis (or PrEP) occurs when people at very high risk of HIV take daily medicines to lower their chances of getting infected. PrEP can stop HIV from taking hold and spreading throughout the body. The consortium, which includes Queen’s, PATH, ViiV Healthcare, the Population Council and LTS Lohmann Therapie-Systeme AG, has been granted over $10m by USAID for research which will combine complementary expertise to develop a novel microarray patch for HIV PrEP in preparation for future clinical trials. 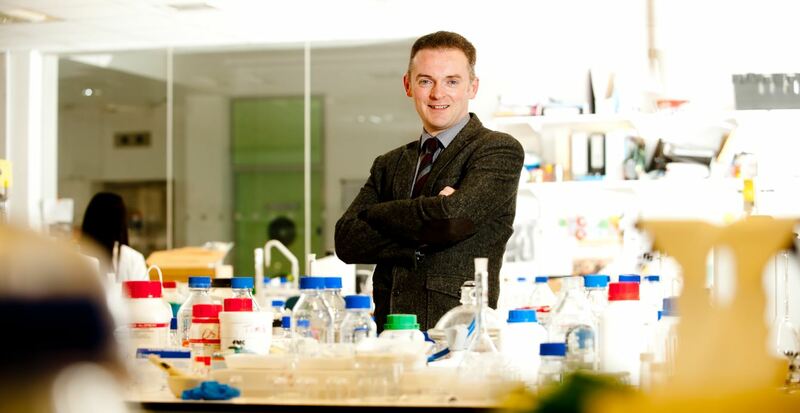 Professor Ryan Donnelly (pictured), from the School of Pharmacy, who is leading the project for Queen’s, welcomed this major opportunity: “This exciting project is very much in line with the research ethos of the University, which is centred on Global Challenges. HIV remains a global health emergency. The collaborators will work with women and healthcare workers in Kenya, South Africa and Uganda to design a microarray patch product that meets their needs. Microarray patches are a discreet, easy-to-use technology containing tiny projections that painlessly penetrate the top layer of skin to deliver a drug. The novel high-dose patches to be developed have been pioneered at Queen’s. The projections themselves contain large amounts of HIV medications in the form of microscopic solid particles. When they dissolve in skin, the tiny particles release the medication over weeks and months. The Joint United Nations Programme on HIV/AIDS (UNAIDS) estimates that 1.8 million people became infected with HIV in 2016, with the majority of infections occurring in young women in sub-Saharan Africa. Consistent use of daily oral HIV PrEP can help reduce the risk of infection, but compliance can be challenging. A discreet delivery mechanism that enables self-administration of a long-acting PrEP – with the potential to protect users for weeks or months at a time – could increase consistent usage for at-risk women and others. The patch should be ready for clinical trials by the end of this advanced 3-year pre-clinical programme. USAID is the lead U.S. Government agency that provides global leadership; supports country-led efforts and applies science, technology and innovation to support the implementation of cost-effective, sustainable and appropriately integrated HIV/AIDS interventions at scale to achieve HIV/AIDS epidemic control.